Archive for the ‘SQLite’ Category. Well, it has been over a year since I last had a customer with a corrupted database problem. Which means that I guess I was overdue. And what problem it is. The operation couldn’t be completed. 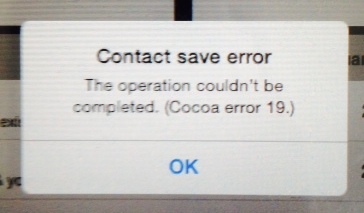 (Cocoa error 19). After some trouble getting the file (it is over 4 GB, not easy to e-mail), I saw a bunch of errors pop up in my debug console, including the dreaded “The database disk image is malformed”, which to me indicated that I needed to try and repair the database file. So I punched up my blog post from February of last year to try and run a repair on it. Unfortunately, I ran into one dead end after another. I was able to dump the data out of the original database file, which produced a text file of over 8 GB. However, no matter what I tried to do to import this data back into a new database, I would end up with an empty new database. 03/14/2014  06:27 PM    <DIR>          . 03/14/2014  06:27 PM    <DIR>          ..
03/14/2014  06:45 PM    <DIR>          . 03/14/2014  06:45 PM    <DIR>          .. It looks like success. I will have to take this data file and put it back on one of my test iPads when I get back into the office and try it out. BTW, Happy Pi Day to everyone out there, whether you are a math person or not. ADDENDUM: After putting the rebuilt SQLite database file back onto my own test iPad and simulator, it worked fine with no issues or cryptic error messages. At this point, you have the .SQL file in the same directory as the bad database file. I received some errors in the next step, so I would recommend that you manually edit the .SQL file and remove any kind of transaction statements. In my example, there was a BEGIN TRANSACTION statement on the 2nd line of the file and a ROLLBACK statement on the last line. I removed both of these lines and re-saved the file. The last step is to launch your Firefox and open the SQLite Manager extension, create a brand new database, select Import from the Database menu, click Select File and find the .SQL file, make sure the BEGIN TRANSACTION/COMMIT check box is clear, and click OK.
At this point, I had a new SQLite file that did not give the malformed error message any more. As with any database file corruption issues, I probably got a bit lucky that the file was not too badly damaged, or damaged beyond repair. BTW, Happy Birthday to Roy Face, the former great Pittsburgh Pirates pitcher. He was one of the coaches at this past year’s Pirates Fantasy Camp, and seemed like a very nice person. BTW, happy birthday to Amy Heckerling, who directed two of my all time most favorite movies, National Lampoon’s European Vacation and Johnny Dangerously.